A white Shona speaking tout is causing a stir in Chitungwiza. Kevin Oliver (35) said he was down and out and wished he was dead. He said he was orphaned at a young age and was raised by Social Services. 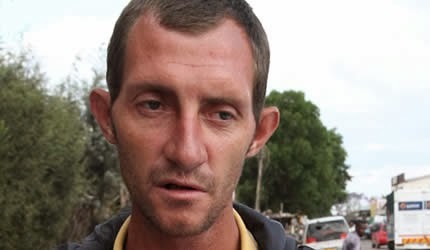 He used to drive a Kombi but when it broke down he found himself with no money and no home. He now sleeps rough in a Kombi at Makoni Shopping Centre. His health is failing and is always hungry. Oliver said his parents drank themselves to death, hence his upbringing was tough.